All junior members are issued with a University Card, which enables you to borrow items from the College Library. You are responsible for any items issued on your card. Readers can borrow items from the issue desk during staffed hours, or by using the self-issue system at any time. Undergraduates, Postgraduates, Post-Doctoral Researchers, Research Associates and Teaching Associates (under Standing Order B.5.2) can borrow up to fourteen items (comprising a maximum of eight books, two CDs, two DVDs and two maps) at any one time. Fellows of the College may borrow up to fifty-two items (comprising a maximum of forty books, five CDs, five DVDs and two maps) at any one time. Undergraduates: one week (except maps – see below). Postgraduates, Post-Doctoral Researchers, Research Associates and Teaching Associates: four weeks (except AV items and maps – see below). Fellows of the College: until the end of the current academic year (except AV items and maps – see below). Audio-visual items are issued for one week. Maps are issued for two weeks. Undergraduates may renew items up to four times. Postgraduates, Post-Doctoral Researchers, Research Associates and Teaching Associates may not renew books; however, they may renew AV items and maps up to four times. Fellows of the College may renew books an unlimited number of times, and may renew AV items and maps up to four times. Items may be renewed at the Issue Desk, online via iDiscover (see below) or using the self-check machine, provided no other reader has recalled the items. Items that are on loan to another reader can be recalled for you. As all readers are guaranteed a minimum of one week's loan, the current borrower will have up to seven days from the date the recall is placed to return the item. During staffed hours please bring all borrowed items to the Issue Desk to be checked in. Outside staffed hours you can use the self-check machine to return items, and drop the items into the Book Returns Box or AV Returns Box (located either side of the self-check machine alcove). Books and maps: 25p per day per item, or 50p per day per item if recalled by another reader. CDs and DVDs: 50p per day per item, or £1 per day per item if recalled by another reader. Fines can be paid in cash at the Issue Desk or online via iDiscover (see below), or can be added to your College bill. For items reported as lost, readers will normally be charged the full replacement cost of the item, including a £5 administrative cost. All readers with borrowing privileges may borrow up to their quota during the Christmas, Easter and Long Vacations. Items borrowed over vacations are to be returned by the first Friday of the following Full Term and may not be renewed at that time. To access your Library account online, simply log in to ‘My Library Account’ from the iDiscover homepage and enter your University Card barcode and surname. 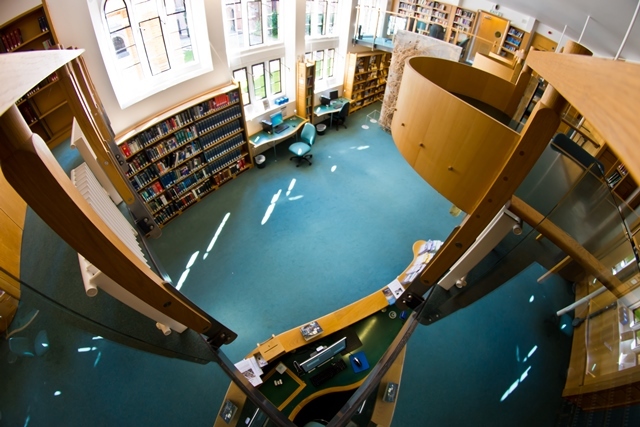 From here you can view the items you currently have on loan from each library you belong to within Cambridge. You can also renew items and pay fines online. Please remember to logout afterwards.